Kiwifruit, or simple kiwi, is also known as the Chinese gooseberry. It is an edible berry with soft texture and a unique flavor. Kiwifruits owe their name to a bird, native of New Zealand, named "kiwi". In many parts of the world, people are referring to this fruit as to kiwi. This kiwifruit is composed of a hairy, brown peel containing green flesh, with white pulp in the center, surrounded by black, edible seeds. This fruit is well-known for its great health benefits. However, some people might be allergic to kiwis as they contain protein-dissolving enzyme called “actinidin”. Allergic symptoms are usually mild and include swelling and itching of the lips and plate. However, serious allergic reactions may include wheezing or even collapsing. Kiwi is full in vitamins, flavonoids and minerals. This fruit is especially rich in vitamin C, and has higher content of this essential vitamin than oranges. One kiwi fruit weighs approximately 125 grams and provides about 103% of recommended daily intake for vitamin C.
Kiwi is also rich in potassium and beta-carotene. Flavonoids posses great anti oxidant capacity and may help protect the body from harmful oxidative damage caused by free radicals. As kiwis contain great amounts of flavonoids, they can protect humans from DNA mutations and cellular damage. 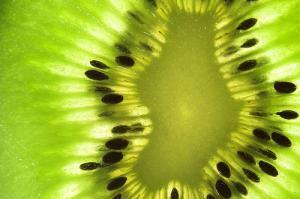 Vitamins C, E and A, found in kiwi, are also proven to protect our body from free radicals. This way, kiwi protects from cardiovascular problems to cancer and obesity. Consuming at least three portions of kiwi per day may reduce the risk of age related macular degeneration by 36 percent. Kiwi is also rich in dietary fiber and may help controlling blood sugar levels. Dietary fiber may help to control diabetes and prevent colon cancer. It reduces cholesterol levels and improves clinical picture in patients with coronary diseases. One kiwi fruit contains approximately 1.9 g of fiber per 100g of fruit. 100 grams of kiwi fruit contains approximately 49 calories. 100 grams of fruit contain around 10.6g of carbohydrates, 1.1 g of protein, 0.5g of fat, and 1.9g of fiber. This fruit is very low in saturated fat and contains no cholesterol. Sodium content in kiwi is extremely low. On the other hand, kiwi contains high levels of dietary fiber, potassium and Vitamin C.
The only bad point about a kiwi's nutritional value is the high content of sugar. One cup of kiwi, approximately 177 grams, contains 15.9grams of sugar. To get the maximum health benefits from kiwi, especially if one is trying to lose weight, it should be consumed unsweetened.